On Jan 26th, fans discovered that PSY, CEO of the newly-established agency P-NATION, followed the PENTAGON ex-member on Instagram. Only a few days ago, rapper Jessi has already joined P-NATION as the first artist to join this agency. PSY also showed his hope of creating an strong, stable agency with perfect solos and idol groups. This is why netizens are wondering if E’Dawn planning on being the next artist to sign a contract with P-NATION. As an artist who has been through many scandals throughout his career, PSY obviously can accept the scandalous love story of E’Dawn. Not to mention PSY is quite close with HyunA who once worked with him through a music product many years back. With unique stage appeal along with impressive music producing ability, E’Dawn is a good choice for PSY if he is looking for new artist for his company. 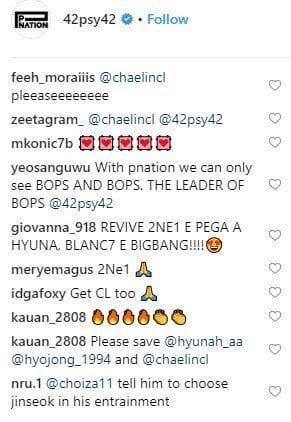 Aside from that, after discovering about PSY following E’Dawn on Instagram, fans are asking the new CEO to sign a contract with many other artists including CL. Watch Park Bogum cover danced TWICE’s hits even better than TWICE themselves!